"Columbus" stands out. Told at a slow, steady pace, it balances images with dialog, and sends its viewers back into the world a little calmer. Set in Columbus, Indiana, an unlikely location for several modern architecture gems of the 1950s, John Cho arrives from Seoul to care of his ailing father, an architectural scholar whose collapse has turned into a death watch. Filmmaker/writer Kogonada gives us broad strokes, the better to let us fill in the blanks. Cho meets young Haley Lu Richardson, who works at the local library and spends her free time contemplating the city's buildings and public spaces. She's compelled to stay in town and care for her mother, a recovering addict. She shows Cho the spaces she loves, and they gradually form a bond with a hint of romance. I doubt many will see "Columbus." It has played on only a handful of screens around the country. 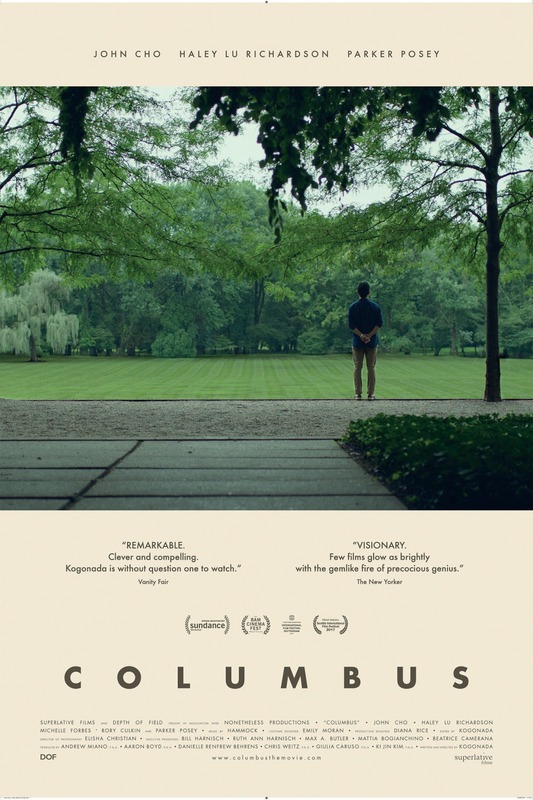 "Columbus," 3½ stars. Does it deliver what it promises? Beauty, friendship, grieving, and growing. Is it entertaining? Decidedly different. Is it worth the price of admission? Beautiful and unique, a gem worth discovering.